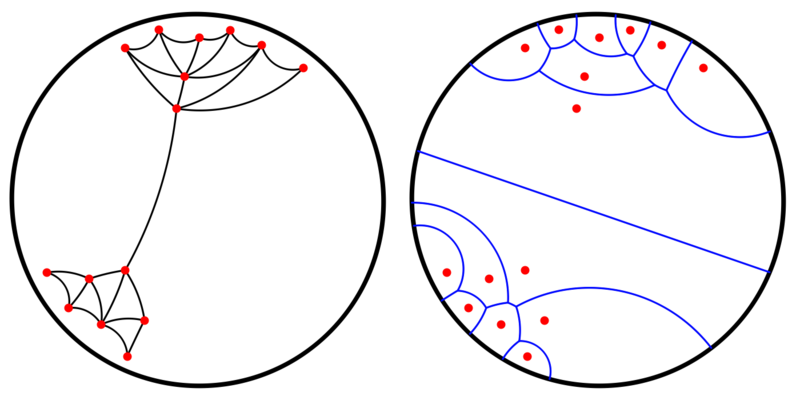 This package enables the computation of Delaunay triangulations of point sets in the Poincaré disk model of the hyperbolic plane. The Poincaré disk model represents the hyperbolic plane \(\mathbb H^2\) in the unit disk centered at the origin in the Euclidean plane: points of \(\mathbb H^2\) lie in the interior of the disk, while its boundary, the unit circle, represents the set \(\mathcal H_\infty\) of points at infinity. In this model, a hyperbolic line is either an arc of circle perpendicular to the unit circle or, if it passes through the origin, a diameter of the unit disk. A hyperbolic circle is a Euclidean circle contained in the unit disk; however, its hyperbolic center and radius are not the same as its Euclidean center and radius. Figure 42.1 The Poincaré disk model for the hyperbolic plane. The figure shows two hyperbolic lines and three concentric hyperbolic circles with different radii. A Euclidean Delaunay face is hyperbolic if its circumscribing circle is contained in \(\mathbb H^2\). A Euclidean Delaunay edge is hyperbolic if one of the empty disks (i.e., not containing any point of \(\mathcal P\)) passing through its endpoints is contained in \(\mathbb H^2\). In the Euclidean Delaunay triangulation, there is a bijection between non-hyperbolic faces and non-hyperbolic edges , illustrated by Figure 42.2 - Right. Figure 42.2 Left: The Euclidean (red) and hyperbolic (black) Delaunay triangulations of a given set of points in the unit disk. Only the colored faces are faces of the hyperbolic Delaunay triangulation. The hyperbolic and Euclidean geometric embeddings of a Delaunay face that exists in both triangulations are different. Right: The shaded face is non-hyperbolic. Its dashed edge is non-hyperbolic, as no empty circle through its endpoints is contained in \(\mathbb H^2\). Its other two edges are hyperbolic. two simplices either are disjoint or share a common face. Moreover, it is connected . From what was said above, it is natural that the class Hyperbolic_Delaunay_triangulation_2 privately inherits from the class Delaunay_triangulation_2. Consequently, users are encouraged to look at Chapter 2D Triangulation of the CGAL manual to know more in particular about the representation of triangulations in CGAL and the flexibility of the design. A geometric traits class Gt, which provides geometric primitives. The requirements on this first template parameter are described by the concept HyperbolicDelaunayTriangulationTraits_2, which refines DelaunayTriangulationTraits_2. A triangulation data structure parameter, for which the requirements are described by the concept TriangulationDataStructure_2. The default for this second template parameter is Triangulation_data_structure_2< Triangulation_vertex_base_2<Gt>, Hyperbolic_triangulation_face_base_2<Gt> >. Two models of the concept HyperbolicDelaunayTriangulationTraits_2 are proposed for the geometric traits class. The first one, CGAL::Hyperbolic_Delaunay_triangulation_CK_traits_2, is based upon CGAL::Circular_kernel_2 and guarantees exact constructions of Delaunay triangulations and dual objects when the input points have rational coordinates. The second one, CGAL::Hyperbolic_Delaunay_triangulation_traits_2, is more general, as it guarantees exact constructions even for input points with algebraic coordinates; however the first model is more efficient for rational points. The example below shows insertion of random points in a hyperbolic Delaunay triangulation. The same set of points is inserted twice. The first time points are inserted one by one, which causes Euclidean faces to be filtered at each insertion. The second time, all points are inserted and the filtering is done once at the end. The example below shows how user-defined info can be added to the hyperbolic faces. a Euclidean Delaunay triangulation with CGAL::Exact_predicates_inexact_constructions_kernel (EPICK) as traits class. Machine 2: Dell Vostro 5471 (2018), CPU: Intel Core i5 @ 1.6 GHZ (up to 3.4 GHz in TurboMode), RAM: 8GB @ 2400 MHz, OS: Ubuntu 18.04 (kernel 4.15.0), Compiler: gcc version 7.3.0. Hyperbolic (CORE traits) 955 sec. 23 sec. 884 sec. 20 sec. Hyperbolic (CK traits) 330 sec. 1 sec. 289 sec. 1 sec. Euclidean (EPICK) 131 sec. 0.71 sec. 114 sec. 0.68 sec. This package implements the algorithms for computing Delaunay complexes in the hyperbolic plane, described by Mikhail Bogdanov, Olivier Devillers, and Monique Teillaud . Mikhail Bogdanov wrote most of the code. Iordan Iordanov added the traits class CGAL::Hyperbolic_Delaunay_triangulation_traits_2 and worked on the documentations. Both were PhD candidates advised by Monique Teillaud. Authors acknowledge partial support from ANR SoS.